Hayden Roofing Co. has served the North Quabbin region since 1973. 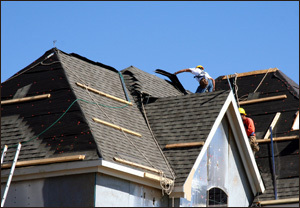 We specialize in both residential and commercial roof replacements. Hayden Roofing is fully insured, offers written estimates, and provides the customer with a informational package containing shingle styles, colors, quality underlayments, ventilation and ice protection. Hayden Roofing has attained the rank of shingle master company and is qualified to offer extended warranties. Most roof projects are started within two weeks of an agreement and usually completed within two days. Contact Hayden Roofing Co. today for all your roofing needs. 10 yr warranty on labor! 25 yr warranty on shingled roofs! when you sell your home! Hayden Roofing Co., (978) 544-3140, info@haydenroofingco.com | Base Content Copyright © 2019 Market Hardware, Inc.